A complimentary hot breakfast is included in your stay. Freshly cracked shell eggs any way you like them or omelets with only the freshest vegetables and grated cheeses. Add house-made turkey sausage, all-natural ham or pan-fried potatoes to complete your meal. ​​​Delicious fluffy, gluten-free cinnamon vanilla pancakes served with real maple syrup or honey. Add banana or berries for breakfast nirvana. Available with whole milk or almond milk. Choose from a variety of all-natural/organic cold cereals. 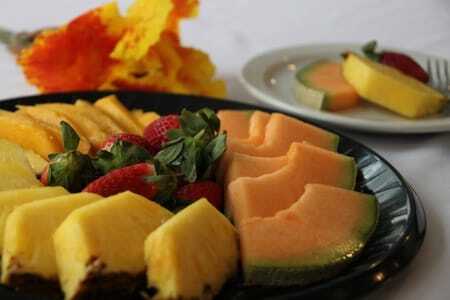 Fresh, ripe seasonal fruits, melons and berries prepared daily. Enjoy organic papaya from our own trees when available. ​Start the day with a robust cup of 100% Columbian coffee or local, all-natural orange or cranberry juices. Prefer tea? We offer a wide range of green, black and herbal teas. Fresh made lemonade and fruit-infused water complete your options. Hours and selections may vary. Hotel guests may invite friends and family to join them for breakfast. The general public is invited to join us for breakfast any time.